NewQ8Bride : A Life after Marriage: THE FIRST DRAG QUEEN BARBIE !!!! 9ij wallah ?? THE FIRST DRAG QUEEN BARBIE !!!! 9ij wallah ?? Is that for real ???? 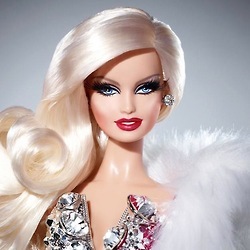 The “Blond Diamond Doll” is created by fashion design duo Phillipe and David Blond, otherwise known as The Blonds, the cross-dressing Barbie was inspired by Phillipe, who is a fab cross-dresser. At $125, the Barbie (available exclusively online this December) comes dressed to the nine’s in her full-length faux white fox fur overcoat and bedazzled silvery corset dress designed by The Blonds"
I absolutely love it. I think it's a brilliant idea. For too long Barbie has set forth unrealistic standards little girls felt they should live up to. Now the makers are using Barbie's popularity to bring a positive light to more realistic issues. There are careful, cautious, classy ways to educate without being obtuse or trashy. I like to think Barbie is a pioneer.